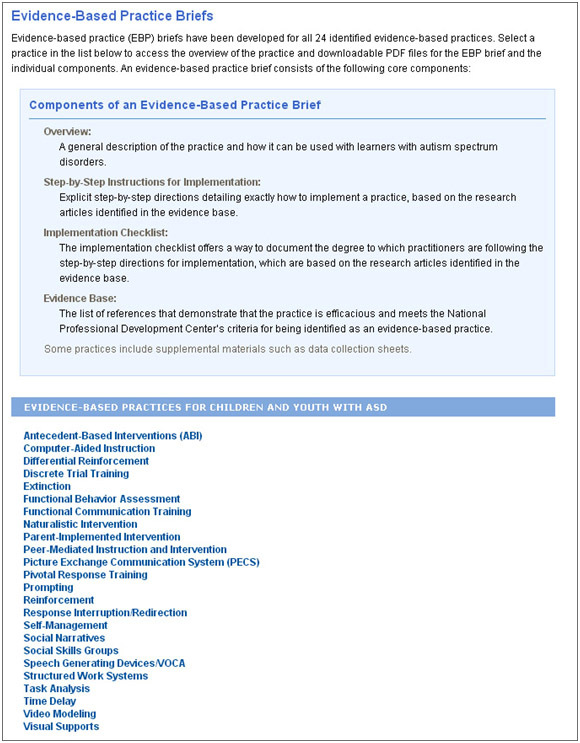 The National Professional Development Center on Autism Spectrum Disorders holds an impressive wealth of information and resources for evidence-based practices for children with autism. We wanted to share their website as a resource to both parents and providers, since evidence-based strategies are so important in devising a home or school-based program for students with ASD. Specifically, we found the online learning and training modules by the NPDC on ASD to be extremely useful and – even better – accessible to anyone online. Each brief package comes in downloadable PDF formats for easy saving and printing. Some practices also come with downloadable data collection sheets and supplemental materials for teachers to use. 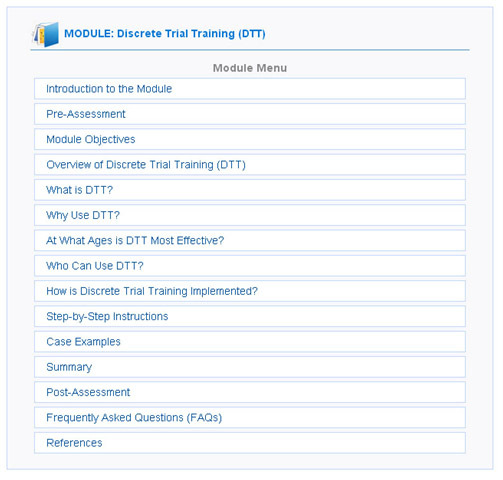 Each module includes a pre-assessment, objectives, an overview of the evidence-based practice, detailed information about the use of the EBP, step-by-step instructions for implementing the practice, case studies, a summary, a post-assessment, frequently asked questions, and references at the end. For more information on the NPDC, visit their website at www.autismpdc.fpg.unc.edu. Written by: Different Roads to Learning on October 1, 2014. This entry was posted in ABA, Academics, Applied Behavior Analysis, autism, autistic spectrum disorder, Behavior, Development, Resources and tagged ABA, Applied Behavior Analysis, autism, autism education, autistic spectrum disorder, behavior management, developmental delays, developmental disabilities, Early Intervention, EBP briefs, evidence-based intervention approaches, evidence-based practices, learning, National Professional Development Center on Autism Spectrum Disorders, online training for autism treatment, Resources, special education, special needs, teaching tools by Different Roads to Learning. Bookmark the permalink.